The Black College Football Museum (a nonprofit) is dedicated to preserving the splendid legacies of coaches and players from historically Black colleges covering 117 years (and counting!) of outstanding athletic, academic and social achievements. And, you can help! We are currently a "virtual" museum, but are moving forward with plans for a physical site and are already in the work of collecting and displaying the many images and stories from the golden age of the Black gridiron. 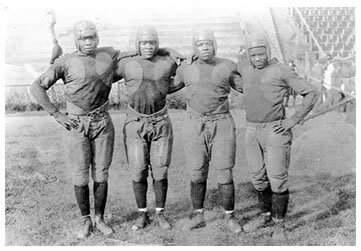 The "Four Horsemen" backfield of Tuskegee (circa 1925) featured, from left: "Big Ben" Stevenson (RB), William Stewart (RB), Ernest Bailey (FB) and Paul Smith (QB), circa 1925. Selected to seven consecutive Black College All-America teams by the Pittsburgh Courier, Stevenson was the first Black college superstar and led the Golden Tigers to instant success. In 1924, he led the team to a 9-0 record and the school's first Black National Championship. In 1925, Tuskegee outscored their opponents 224-6 for their second straight perfect season and another national title. In all, Stevenson led the school to six Black National Championships and a remarkable 69-2-9 record in eight seasons.